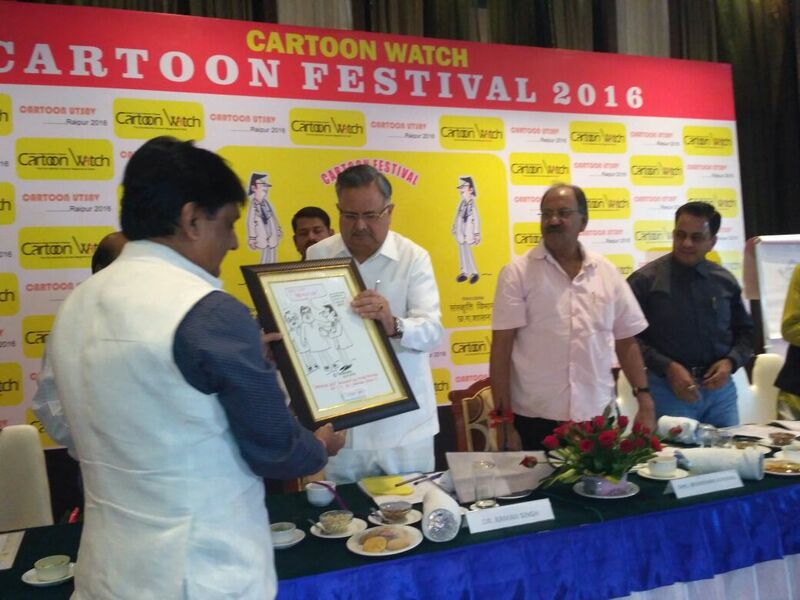 Dr Raman Singh, Hon'ble Chief Minister of Chhattisgarh launched the 100th Prince cartoon at Raipur during the Cartoon Festival on 12th October 2016. 'Prince' is the cartoon character published in the emagainze PreSense since July 2008 edition. The first Cartoon with Prince character was launched by Dr Abdul kalam in July 2008 at Chennai. From July 2008 edition, every edition of PreSense used to carry one Prince cartoon drawny Triambak Sharma, Editor, Cartoon Watch and a well known cartoonist in the North India. 100th Prince cartoon will be carried in the 116th (October 2016) edition of ezine PreSense. The eMagazine PreSense is being published by Prime Point Foundation. 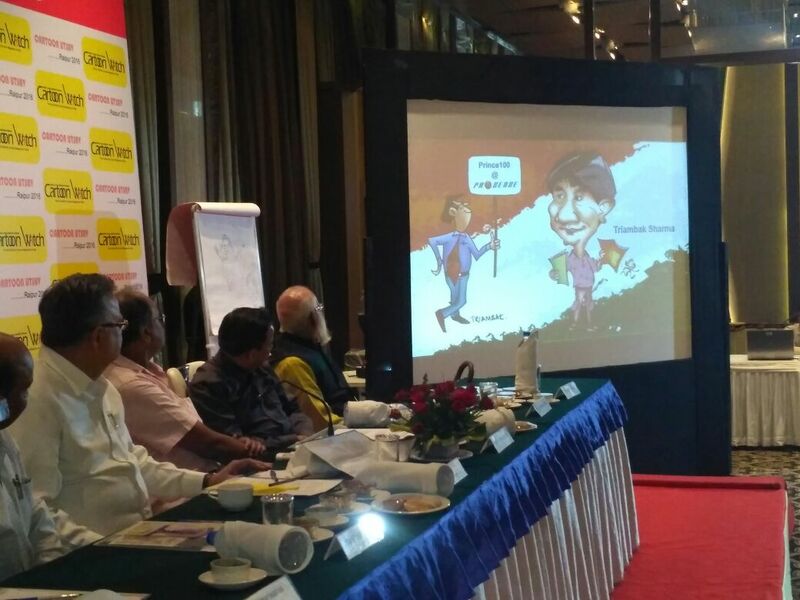 On the suggestions of Dr Abdul Kalam, PreSense introduced cartoons. The Prince cartoon character was designed by Triambak Sharma on the lines of Common man of RK Laxman. Prince represents the modern youth wearing trendy dress. Before the launch of Prince100, a video presentation by Prime Point Srinivasan was screened before the Hon'ble Chief Minister and the audience. Dr Raman Singh, Hon'ble Chief Minister appreciated the concept of Prince Character and appreciated the eMagazine PreSense for carrying the messages through cartoon character. Dr Raman Singh watched the video presentation with keen interest. Please watch the video presentation on the journey of Prince. The ezine PreSense, started in March 2006 has now completed 115 monthly 'digital only' editions. We started publishing 'digital only' editions from March 2006. Due to the growth of internet and technology, in future, digital only publications like eMagazines (ezines), ebooks, eNewsportals will gain more importance and acceptance. This ezine is being published by Prime Point Foundation. Though our ezine PreSense is visible in virtual world only, PreSense has already taken up three initiatives of forming real world Education Loan Task Force (ELTF), Sansad Ratna Awards and Digital journalists Association of India (DiJAI). On this auspicious Vijaya Dasami day, we are pleased to announce 'PreSense-ebooklet', another digital only initiative. As you know, ezine PreSense is being published on the first day of every month with contents on different themes. Presently, our editorial team members research the topics and write the contents in their names. Each article is confined only to two to three pages in A4 size (around 1200 words). We carry six or seven articles every month. We find that digital reading is becoming increasingly popular, as they can be read in any device like phone, tablet, iphone, kindle, desktop, etc. ebooks are becoming popular nowadays. At the same time, people are interested to read less contents in a quick manner in the digital medium. They prefer less number of pages in the digital format, than what they could read in the print format. 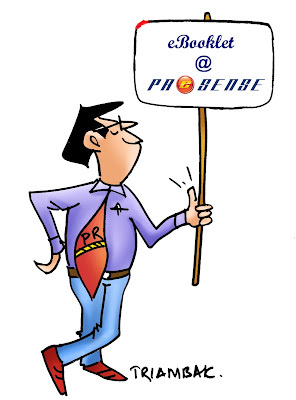 Keeping the digital trends in mind, Editorial Team of PreSense has come out with a new initiative of 'PreSense -ebooklet'. This will provide opportunity to all, particularly youngsters, who aspire to become authors to learn digital writing. Unlike the ezine PreSense, PreSense-ebooklet will not have any periodicity. As and when ebooklets are ready, they will be released through groups and other channels like the ezine. 1. Maximum number of Pages 30 (around 9000 words) in A5 format. The ebooklet can be written on any theme, including economics, commerce, science, communication, interviews, etc. The content should be broken into several chapters. The author should ensure that another person edits the contents. 2. The contents should be only in English. 3. After approval by the editorial team, the PreSense-ebooklet will be released digitally. All the ebooks will be stored in the Library of our site www.corpezine.com. The ebooklet will be released under the PreSense platform with due credit to the author of the book. Every month, our ezine Presense will carry details about the ebooklet launched during that month along with a brief profile of the author. 4. Those who are interested to write an ebooklet on any theme may contact editor@corpezine.com for guidance about the structure, font, design, etc. The purpose is to make potential writers as 'authors'. For time being, there is no revenue model for this scheme.